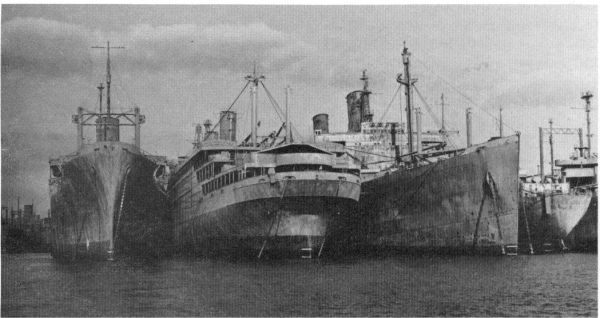 Center ships are (left) the Wakefield and (right) the Washington, 1930 ocean liners used as troop ships in World War II. The Hudson River National Defense Fleet established by an act of Congress in 1946, was first located off Tarrytown, one of eight anchorages in the United States to provide a sizable group of merchant ships to support the military effort at the outset of any war. When foreign nations at the outbreak of World War I had diverted their ships for watime service, the small American Merchant Marine fleet was unable to transport even 10 per cent of normal foreign exports. 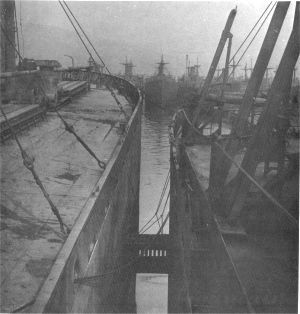 Docks in major ports were stocked high with products of American farms and factories for which no ships were available. When foreign vessels were again available, their rates were ruinous. On April 30, 1946, the Hudson River fleet was moved further north to Jones Point (at one time known as Caldwell's Landing) at the foot of Dunderberg Mountain. Here the anchorage remained until the last two ships were towed away on July 8, 1971, to be sold for scrap to Spain. These, both World War II Liberty ships, were the Edwin M. Stanton and the Earl A. Bloomquist. The fleet was at its peak with 189 ships in July of 1965. Anchored in ten rows, it extended from the fleet office at the Jones Point dock several miles to the south – to the Lovett Orange and Rockland Power Plant and the Boulderberg House at Tomkins Cove. Several viewing points were established along Route 9W for the hundreds of motorists who stopped daily to look at the ships. During the Korean War, a total of 130 ships was taken from the Hudson River fleet leaving only 39 ships. During the Suez crises in 1956, 35 ships were put back into service when British and French ships were diverted from trade routes to supply their nations' armed forces. The Vietnam War required more than 40 ships. When the U.S. Department of Agriculture in 1953 needed storage space for large volumes of government-owned wheat, it turned to the Hudson River Reserve fleet. During the following ten years more than 53,563,948 bushels of wheat were loaded into 231 ships. Approximately 255,000 bushels of wheat were stored in each ship with the number of ships carrying wheat at any given time ranging from 70 to 90. The last ship was unloaded in 1963. Ships that had stored wheat rose about twelve feet higher above the water surface and exposed a bright orange band of rust. A ventilation system had been installed in the ships, making it possible to maintain the quality of the wheat for long periods of storage. This saved the U.S. government some five million dollars on commercial storage estimates. None of the grain, sold to foreign countries in the 1960's, was found to be spoiled when unloaded. The fleet was subject to litigation filed in federal court by Mrs. Theresa Scozzafava, owner of Barney's Restaurant at Jones Point for many years., She claimed the ships were anchored on what she called her "front lawn" because she owned up to 250 feet out into the river. She also claimed the ships obstructed her view of the river itself. Her attorney was Abraham Kopald of Kopald and Haft, Highland Falls. In her action against the U.S. Maritime Commission, which operated the fleet, Mrs. Scozzafava asked $10.00 in rental fees for using her lawn. The case was discontinued because she did not have sufficient funds but the fleet was actually moved a short distance further south. Mrs. Scozzafava died August 11, 1971, at the age of 87 years. The ships were kept in condition on a year-'round basis by a crew of 86 men under the supervision of Charles R. Gindroz of Pearl River, fleet superintendent and one-time chief engineer on the George Washington, the ship which years before had carried President Woodrow Wilson to France and in 1950 burned at Baltimore. The reserve fleet ships, valued at over $255 million, had their machinery turned over periodically and their internal surfaces sprayed with a coat of preservative oil on a regular basis. Electrical equipment, such as generators and motor wiring, were cleaned and coated with a fungus-retarding varnish. All loose scale and rust were water-blasted off decks, hulls and superstructures. Then the entire outside of the ships was sprayed with a gray-tinted preservative oil. This was done at least once a year on each ship. The underwater portion of the hull was protected by means of an electric current, a method known as cathodic protection, in which the hull is made passive, preventing corrosion from taking place. In the mid-1960's, the U.S. government was spending $735,280 each year for the preservation and maintenance of the Hudson River fleet. This included salaries of workers, who lived locally, and aroundthe-clock patrol of the fleet to guard against unauthorized persons entering the ships. The patrol was done by tug boats which also used to ferry workers to and from the ships each day. Other reserve fleets were anchored at Astoria, Oregon; Olympia, Washington; Suisan Bay, Caliornia; Mobile, Alabama; Beaumont, Texas; Wilmington, North Carolina; and James River, Virginia. Ships not sold for scrap from the Hudson River fleet were transferred to the James River fleet. While the Hudson River site was closed April 30, 1971 as far as the Maritime Commission was concerned, Mr. Gindroz and Douglas Warn, tug boat captain, remained at the site until July 8, 1971 as caretakers of the last two ships that had been sold for scrap in Spain. Their salaries during this time were paid by the ships' owners, not the federal government. Mr. Gindroz retired to his home at 178 North Main Street, Pearl River. Mr. Warn is a Fort Lee, N. J., resident.